Biodiversity (the diversity of ecosystems, species and genes) plays an essential role in supporting human well-being through maintaining functioning ecosystems that in turn deliver ecosystem services such as food, the regulation of our climate and aesthetic enjoyment. The System of Environmental-Economic Accounting 2012 Experimental Ecosystem Accounting (SEEA-EEA) provides a framework to measure and link ecosystem service flows supported by biodiversity and other ecosystem characteristics (e.g. soil type, altitude) with the economy and other human activities. It also allows comparison and integration of data on ecosystem services with other economic and social data. Biodiversity Accounts, one of a number of accounts in the SEEA-EEA framework, can help understand the relationship between biodiversity within ecosystems and economic development and planning activity by cutting across this data in a spatially explicit manner. Accounting for aspects of biodiversity is complex and as such experimentation of biodiversity accounting by countries is less advanced than water or carbon accounting, for instance. This technical guidance document has been prepared in the context of the Advancing the SEEA-EEA project. It is aimed at practitioners who wish to collect and organize data to understand the status and trends of ecosystem and species diversity and incorporate this into the SEEA-EEA framework for national accounting. This document considers the concept of biodiversity in relation to ecosystem functioning and condition and its resilience in the context of national accounting. It reviews some (but not all) of the established approaches to assessing the extent and condition of ecosystem diversity and for measuring species diversity, and examines their suitability for accounting purposes. This document sets out the data mobilisation process for national scale data and considers the use of global datasets and models to inform Biodiversity Accounts and other accounts in the SEEA-EEA framework, such as Ecosystem Condition Accounts. To assist countries in implementing biodiversity accounting, this technical guidance document presents experimental Biodiversity Accounts drawing on case studies from around the world. These are presented using a three tiered approach based on data availability. Other experimental accounts for Ecosystem Condition Accounts and Ecosystem Capacity Accounts are also shown. This document also highlights issues for resolution and recommendations for testing, refining and validation in relation to biodiversity accounting. Suggested citation: UNEP-WCMC (2015) Experimental Biodiversity Accounting as a component of the System of Environmental-Economic Accounting Experimental Ecosystem Accounting (SEEA-EEA). 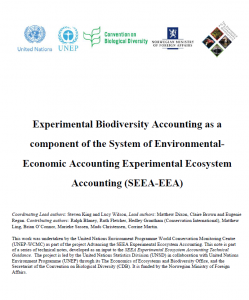 Supporting document to the Advancing the SEEA Experimental Ecosystem Accounting project. United Nations.